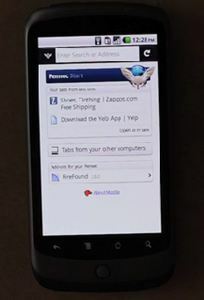 Fennec (codename for Firefox mobile) is the first mobile browser from Firefox, has reached another milestone with the Alpha release for Android and Nokia N900 devices. The latest version of Fennec is built on the same technology engine as the desktop Firefox 4 and is packed with similar features like Firefox Sync, Add-ons and the Awesome Bar. This release also includes the major technologies which is called “Electrolysis” for increase the performance by run the browser interface in a separate process from the one rendering Web content. Pinch-to-zoom (Android), double-tap, or use the volume rocker (Nokia N900) to zoom in and out. Tabbed browsing in thumbnail view lets you easily see and open the site you want. Location-Aware Browsing give you content and info relevant to location. Save to PDF in the Site Menu lets you capture important content such as driving directions or a boarding pass, to view offline. Find in Page in the Site Menu lets you quickly find text on the webpage. Share Page in the Site Menu lets you send content to email, Facebook, Twitter and Google Reader. Forget Password in the Site Menu tells a website you no longer trust to forget your private data. Add Search Engine in the Site Menu lets you quickly add a new search engine to your Awesome Screen. Context Menu lets you Open in New Tab and Share by long tapping and holding a link. Smart Tapping lets you tap on links, widgets and other Web content with accuracy. Password Manager lets you choose to remember site password to avoid typing. The Fennec Alpha is now available for free download on your Android device or Nokia N900 by visiting firefox.com/m/alpha. For those who interested to download Fennec Alpha to their PC in order to test, provide feedback and build add-ons, just head to the following URL to access official Fennec Alpha download.